My Argyle with a Twist Infinity Scarf needed a hat to match, to wear them as a set. So here it is: the Argyle Crochet Hat with Removable Pompom! I hope you enjoy! *Disclaimer: This post includes affiliate links. The yarn was provided by Red Heart Yarns. 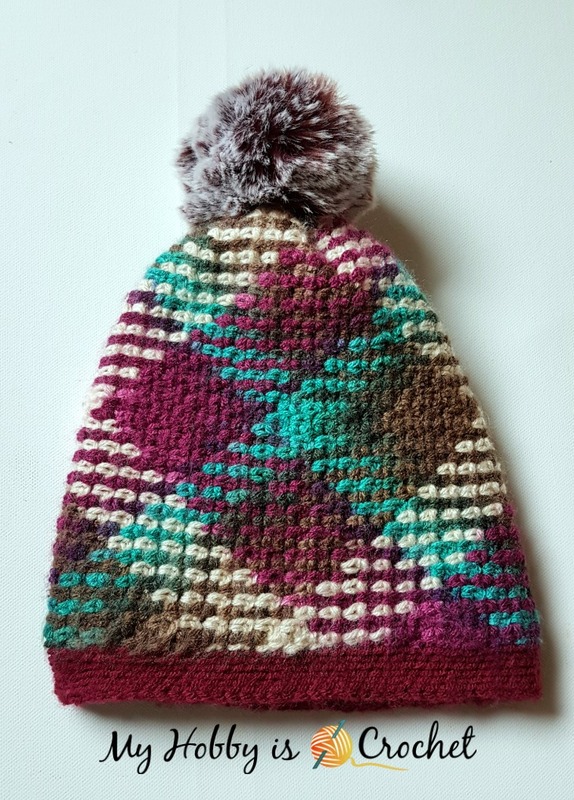 For this hat you will not need to make any color changes, we will use a variegated yarn and the technique of planned color pooling in crochet with the moss stitch. Because the moss stitch pattern it's only stretchy in height, I chose to work the hat sideways in rows. That produced a stretchy hat, that is very comfy to wear. The removable pompom is great! You can take it down when washing the hat, but you can also use the same pompom for several hats! That will save you some money for pompoms! SIZE: This slouchy hat would make a great fit for teens and adult women. The circumference of the hat is customizable to the size you need by working less or more rows. - optional Sew-On Snaps to make the fur pom pom detachable. NOTE: The hat is worked sideways in rows, than the ends are joined together to form a tube. After joining into a tube, you’ll shape the crown working decreases in the round. Finally you’ll add a brim worked in the round also. GAUGE: It is important to maintain the correct placement of the stitch color vs. gauge! You will need to adjust the tension of the sts to get the correct number of stitches in the correct place every row! Although I have used for both hat and scarf the same type of yarn - Red Heart Super Saver Antique from the same lot, the two skeins of yarn had different color sequences. This will be a full color sequence that will have to repeat throughout the pattern! It doesn’t matter which color you start with. The hat will be worked in rows sideways, going through one color sequence, the same as the Argyle with a Twist Scarf pattern. 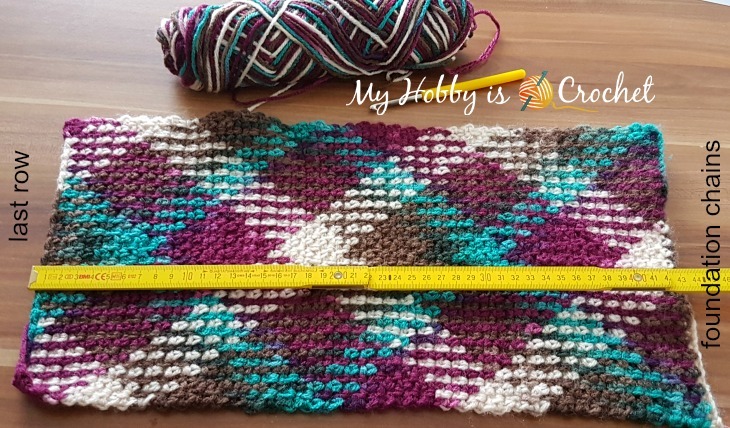 Using Red Heart Antique yarn and a 5 mm crochet hook, begin by chaining through at least one full color sequence of the color repeat, making sure that the last chain on your hook is the first color of the next section. 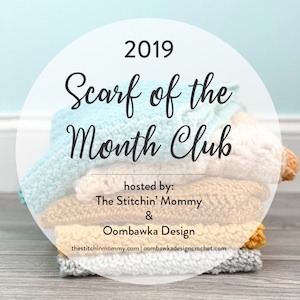 You will now start to work the Moss stitch pattern! Don’t worry about the long tail of foundation chain stitches! You will unravel the unused chain stitches at the end of the work. To get the argyle to work, you’ll need to shift the color sequence over by 1 stitch (if not, the colors will stack on each other forming vertical stripes). To shift the color sequence over by 1 st, unravel the last sc and ch 1 of the last color! The piece is very stretchy, so keep that in mind. I like my hat to be fitted and not loose on my head. My piece measured unstretched 43 cm (17”) and my head measures 56 cm 22”. Fold the piece into half so that the foundation chains row and the last row are one above the other. Use your crochet hook to join the ends together : ch1 and slip stitch the sides together this way: work 1 sl st inserting the hook through the first ch1 space of the last row and through the first ch 1 space of foundation chains, *ch1, slip stitch again through both sides as written above; repeat from * until the end of the row. Cut yarn. Fasten off. Weave in all ends. Work around one edge of the tube. Round 2: Working into back loops, *sk 1 st, 1 sc in next st, repeat from * around, join with sl st to first sc. Cut yarn leaving a long tail that will be used to close the hole on top of the hat. Turn the hat inside out, thread needle with the long yarn tail, insert the needle through remaining sts on the last row of the crown and pull the yarn tight to close the hole. Weave in to secure. Using a 5.5 mm crochet hook, join yarn color B with sl st at middle back, on the hat edge. Sl st loosely in each st around; do not join into round, continue working in continuous spiral rounds working into back loops only, sl st loosely in each st around until your brim measures 2.5 cm (1”). Fasten off invisibly at the middle back. Note: If the brim is too tight, you can work the sl sts of the brim with a larger hook size. Sew one piece of the snap on top of the hat and the other piece of snap sew it on the pompom. Watch this Video Tutorial on Youtube to learn how to do it! Now you just need to snap your pompom on the hat! And your hat with removable pompom it's ready to wear! Yarn Pooling Made Easy by Marly Bird (Affiliate Link) - Downloadable Product on Leasure Arts. If you want to share this information with someone, please share the link to this post. Do not repost/ reprint the pattern to any other sites.